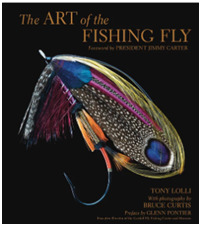 The ultimate book for fly fishing enthusiasts, featuring stunning photography of flies and the fishermen who use them. Features a foreword by President Jimmy Carter! For the millions of fly fishers who are passionate about their sport, this gorgeous book is both a visual feast and the perfect reference. The Art of the Fishing Fly includes a history of fly fishing focusing on the evolution of fishing flies; a guide to essential equipment; a how-to section on tying three key flies by three top fly tyers; and essays by noted experts. The book’s core includes 75 profiles of flies—the soul of the sport—with absolutely stunning color photographs of each fly and fascinating stories behind the flies, inspirational photographs of fly fishers in action, and profiles of the top 19 fly fishing locations around the world. Tony Lolli is an author, columnist, and fly-fishing guide. His columns have appeared in Hunting and Fishing News, American Angler, and On the Water magazine, among others. He has written several books on fly fishing and tying. The New England Outdoor Writer’s Association selected his Amazing Fishing: Facts and Trivia (Chartwell) as one of the three best books for 2012. Bruce Richard Curt has chronicled many significant events of the last decades of the twentieth century as a photographer for Time, LIFE, and Sports Illustrated, from the front lines of the Vietnam War, to the explorations of Jacques Cousteau, to the action on fast-paced sports fields. Curtis’s photographs have been in dozens of books. He is an avid fly fisherman who travels around the world from the Amazon to Scotland fishing and photographing. The Catskill Fly Fishing Center and Museum is a nonprofit educational organization dedicated to preserving the fly fishing heritage, teaching the next generation of anglers and promoting the future of fly fishing. The center operates a historical and contemporary museum and an education center, and is a gathering place for the entire fly fishing community to share their ideas and experiences.